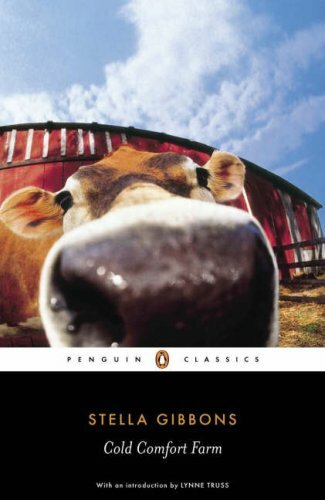 I heard about Cold Comfort Farm for the first time while I was on study abroad in London my sophomore year of college. Some of the girls in my group were chatting about the film adaptation of it one night and I listened in as they laughed and laughed and quoted perfectly hilarious lines that had me itching to watch it myself, particularly given the wonderful cast, which includes Kate Beckinsale, Ian McKellen, Rufus Sewell, and Stephen Fry. One of the girls had actually read the book itself and told me I should make sure to start there before viewing the movie. So, when I ran across a lovely used copy on sale for a pound in an Oxford bookshop, I pounced on it and stashed it in my suitcase to read when I got home. You see, I had some inkling of how homesick I would be for England after I left it and knew I would need some good reading to get me through the transition back to the States. 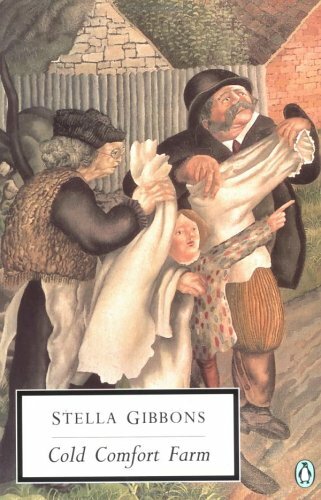 Originally published in 1932, Cold Comfort Farm was Stella Gibbons' first novel and a cracking good one at that. With a wonderful and quite shameless panache, it parodies the dark and angsty rural novels popular at the time, particularly the works of Thomas Hardy, Emily Bronte, and D.H. Lawrence. Several of their novels are actually referenced in the book itself and anyone familiar with them (fans or not) will appreciate the light touch Gibbons takes while poking fun at them. I am curious as to how many of you have read, or at least heard of, this novel. It is an absolute gem and one that never fails to bring a smile to my lips. Flora Poste is in some difficulty. Having been meticulously educated to within an inch of her life, she finds herself unable to support herself when her parents die rather suddenly, leaving her penniless and homeless. After temporarily moving in with an old friend, she sets about writing a sheaf of letters to a host of distant relatives, inquiring after the possibility of moving in with them until she can come up with a way of taking care of herself. Though she receives numerous and downright alarming responses from various and sundry relatives, it is the last one that catches her eye. And for good reason. "So you are after your rights at last. Well, I have expected to hear from Robert Poste's child these last twenty years. "Child, my man once did your father a great wrong. If you will come to us I will do my best to atone, but you must never ask me what for. My lips are sealed. "Child, child, if you come to this doomed house, what is to save you? Perhaps you may be able to help us when our hour comes. 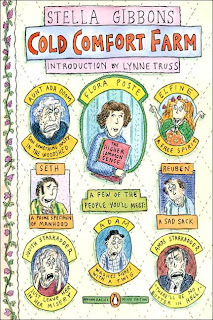 Against her friend's probably wise wishes, Flora immediately decides to go and live with the Starkadders at Cold Comfort and see what exactly Aunt Judith means by "her rights" and if they might include something practical like oh, say, money. Or a house. But when she arrives in Sussex, it is clear that it is she who has something to give to her bizarre and backwoods relatives. And so, in true Flora style, she rolls up her sleeves and goes about setting things to rights. What follows is one the most hilarious romps I've had the pleasure of encountering. "Will you have some bread and butter?" asked Flora, handing him a cup of tea. "Oh, never mind your boots, Adam can sweep the mud up afterwards. Do come in." He stood at the table facing Flora and blowing heavily on his tea and staring at her. Flora did not mind. It was quite interesting: like having tea with a rhinoceros. Besides, she was rather sorry for him. Amongst all the Starkadders, he looked as though he got the least kick out of life. After all, most of the family got a kick out of something. Amos got one from religion, Judith got one out of Seth, Adam got his from cowdling the dumb beasts, and Elfine got hers from dancing about on the Downs in the fog in a peculiar green dress, while Seth got his from mollocking. But Reuben just didn't seem to get a kick out of anything. "Is it too hot?" she asked, and handed him the milk, with a smile. The opaque curve purred softly down into the teak depths of the cup. He went on blowing it, and staring at her. Flora wanted to set him at his ease (if he had an ease?) so she composedly went on with her tea, wishing there were some cucumber sandwiches. After a silence which lasted seven minutes by a cover glance at Flora's watch, a series of visible tremors passed across the expanse of Reuben's face, and a series of low, preparatory noises which proceeded from his throat, persuaded her that he was about to speak to her. Cautious as a camera-man engaged in shooting a family of fourteen lions, Flora made no sign. "I ha' scranleted two hundred furrows come five o'clock down i' the brute." "Did you?" in a bright, interested voice. She saw at once that she had said the wrong thing. Reuben's eyebrows came down and his jaw out. Horrors! He thought she was doubting his word! "Ay, I did, tu. Two hundred. Two hundred from Ticklepenny's Corner down to Nettle Flitch. Ay, wi'out hand to aid me. Could you ha' done that?" "No, indeed," replied Flora, heartily, and her guardian angel (who must, she afterwards decided, have been doing a spot of overtime) impelled her to add: "But then, you see, I shouldn't want to." And that is just a small sampling of what you find inside this slim, delightful novel. The parody is masterful and the whole, twisted plot just gets zanier and zanier right up to its dramatic, fitting, and perfectly folded hospital corners conclusion. Highly recommended for Jane Austen fans in need of a good laugh. And, just for fun, here is the trailer for the 1995 film. It's hysterical and I absolutely adore it. I haven't heard of this book before but it sounds like a delight! Thanks for the review-now I have another book to add to the tbr! I've wanted to read this book for a long time--ever since I saw the movie, actually--but I haven't gotten around to it. Someday I will, though! I have heard of this book but never read it. I am going to now though. 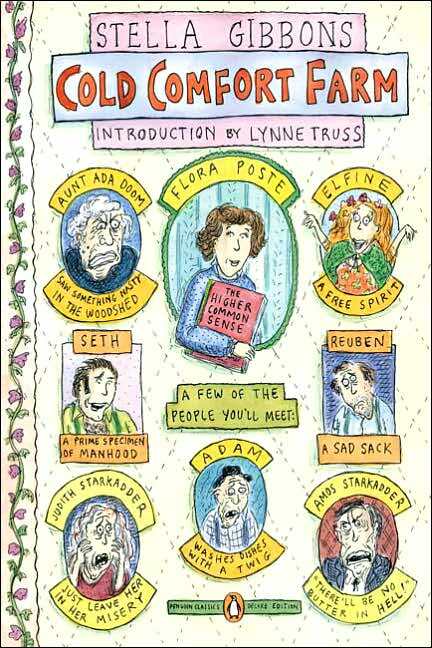 If it pokes fun at Lawrence, Bronte and Harding I'm all there. I love this feature. And thank you, particularly, for featuring this book. I've had it on my TBR shelf for about a year, but I haven't yet taken the plunge. You've inspired me. I hope to see you today at the Utah bloggers bash! I have been looking for something different to read, I think I just found it! Thank you. Emily, ooh, definitely check out the movie. It's hilarious. Charlotte, I feel the same way. Haven't ever picked them up because of it. Tiffany, that's exactly what I wanted to do right after finishing as well. Heather, that is the word for it. Perfectly pleasant from start to stop. heidenkind, I think you'd really appreciate it after having seen the film. Brandy, aw, thank you so much for saying that. I'm so glad. Jessica, I'm delighted the RF posts are working for you. I always hope they connect with someone and don't just drift out into the void. :) I'm also SO sad I missed meeting you at the blogger social. We were out of town. Hopefully we'll be sure to make it to the next one. Tiah, *grin* this one is definitely different. I loved this book, Angie. You've made me want to read it again, and to see the movie again. Travis watched it with me and we still laugh about the water voles. Emily, oh my goodness. The water voles. I actually watched it for the first time with Adam and we were practically hysterically over the, "Well sure you did, baby. But did it see you?"